This has occupied our thoughts here lately. This is Ten Sleep’s Fire Hall. 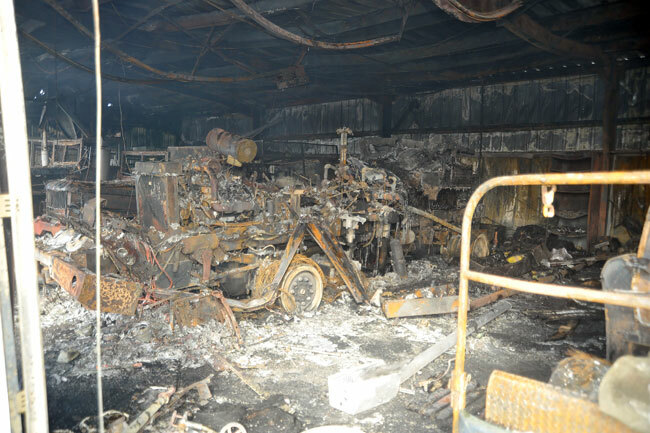 Sunday night it burned down… with 5 vehicles inside. How ironic that a fire hall would burn down, especially since it is one of the “newer” buildings in Ten Sleep. We have many more buildings that have worse wiring, construction, or care than this one! It was a freak event… They figured that snow and ice on the roof slid off, bent and shoved the propane line into the building where gas accumulated until, most likely, the heater set off the fumes. We are very grateful no one was injured. We’re a volunteer fire department, so our hall isn’t manned continuously. Thank goodness. The building and vehicles and everything else was a total loss. That night, Vernon responded when we heard about it, although neighboring Worland’s department was there in 31 minutes. Worland is 27 miles away, so they busted their butts getting over here. Vernon left our FastTak truck there that night to provide minimal coverage for the town. Firefighter communities are close… and Wyoming communities are close, too. As a result, in 48 hours, Ten Sleep had two more trucks and full gear for our firefighters loaned and gifted to our district. Twenty-one, TWENTY ONE! other agencies have volunteered equipment, donations have poured in, and fundraisers are being discussed. Vernon has been on the Fire District board for oh… probably… a zillion years… and he’s just flabbergasted at the help and speed and generosity of people. They’re just meeting with the insurance guys this week. I’m helping set up a spreadsheet for inventorying items. There’s a lot to think about and discuss and hash out. It’ll all get done… and we’ll rebuild and purchase new equipment… I think they should call it Ten Sleep’s Phoenix Fire Hall, because we *will* rise from our own ashes! I am so thankful no one was injured!! The fire/police family have big hearts so I’m not surprised how quickly the donations have started pouring in. I’m proud to be a part of it. Carol you should think about starting a GoFundMe page! I’d be happy to donate 🙂 Seriously!!!! There is a GoFund Me page for the fire, or you can send your money straight to the Fire Dept. in Ten Sleep, 82442. So sorry about the freak fire, but glad for the outpouring of support. So very thankful no one was injured or lost in this incredible freak fire. We are also involved with our village’s volunteer department maybe I can collect something for a fundraiser from Wisconsin. T-shirts from all the area departments or something like that. Let me know. I am glad no one was hurt. I have several volunteer firefighting friends and they have the biggest hearts of gold! If y’all setup a ‘donate’ on line fund, post it here…. I’d be happy to donate in their honor…. There is a GoFund Me page for the fire, or donations can be sent straight to the Dept. in Ten Sleep, zip is 82442. So sorry for a great lose. But, just shows how people will step up and help. Makes a heart smile. Big city folks don’t know what they are missing. How terrible. Small town fire companies are the heart of a community. How wonderful, but not surprising, that everyone else’s is reaching out to Ten Sleep. What a great community! I am so glad no one was hurt! Wow! Rough! So heartwarming that so much help has been given though!! So very glad that every one is safe. How wonderful that you have had so many offers of equipment and donations. No matter what TV and newspapers say there are a lot of people around who do care. Like the lady in my local Supermarket who stopped serving to help a co worker who was having trouble with a bunch of flowers. She was allergic to them and it was affecting her breathing. Afterwards she said ‘any more flowers, let me know and I’ll deal with them’. Hope the spreadsheet goes well. I loved working in them. Everything stayed in their cell (well most of the time).